It’s hard to believe that Marvel’s two superpowered lawyers, Jennifer “She-Hulk” Walters and Matt “Daredevil” Murdock, have never before faced off in a courtroom, but that finally changes in next week’s She-Hulk #8. The specifics of the case are still muddy, but we know it involves Steve Rogers—currently in a properly aged 90-year-old body, following the events of Rick Remender’s Captain America series—and his past as a soldier in World War II. Steve is the latest character in this book’s parade of guest stars, but writer Charles Soule never lets the focus veer too greatly from Jen and the rest of her firm’s employees whenever other superheroes drop by. Soule did outstanding work reintroducing forgotten ’90s hero Nightwatch in July’s #6, and last month’s #7 featured one of the most delightful Hank Pym stories in recent memory, with incredible artwork from the returning team of Javier Pulido and colorist Muntsa Vicente. This preview of next week’s issue showcases the clear, expressive character storytelling that makes Pulido a perfect collaborator for Soule, and Vicente gives the linework even stronger impact with a diverse color palette that adjusts for changes in tone. Compare the sterile colors of the opening page of this preview with the more vivid hues of the scene in Jen’s office, or the grainy, muted shades of the final flashback splash, and it becomes clear just how important color is in setting the atmosphere. 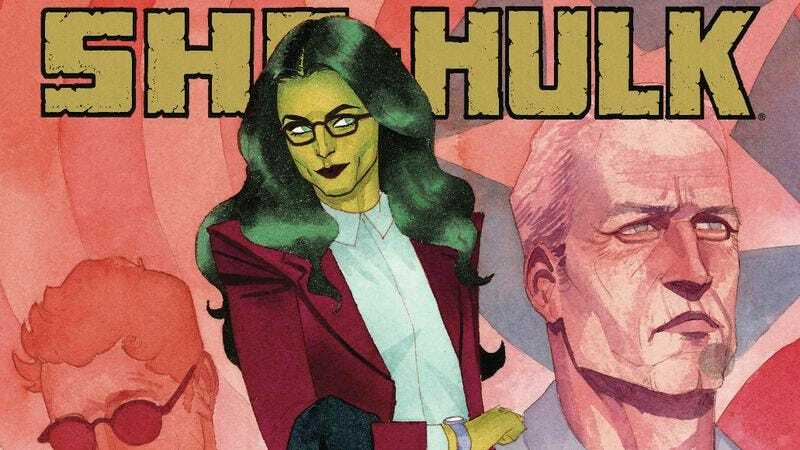 The attention to detail in the writing, art (including Kevin Wada’s exceptionally glamorous covers), and colors showcases the creative passion that has made She-Hulk one of the year’s top superhero titles, delivering a hugely entertaining hybrid of costumed action and legal drama that should only become more engaging as Marvel’s most prominent attorneys go head-to-head.